Everything looks right. I would take your command and copy into a notepad and make sure you aren't getting some funky spaces or something. If your access key is wrong it will say "wrong key" if the session ID isn't right it will say "session not found" so something else is going on here and I have a hunch there is some hidden spacing at the end or something. 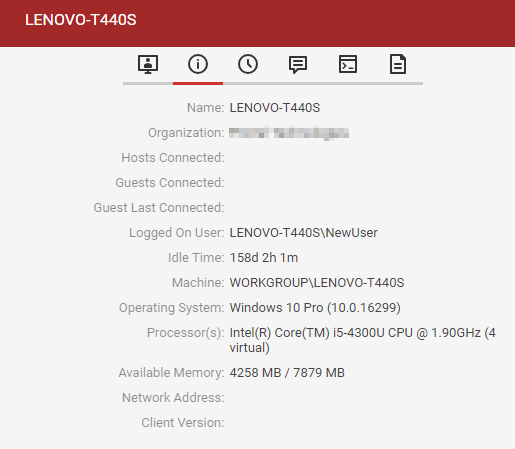 There is certainly something weird going on, that session ID exists in screenconnect, I can see it, but its not returning any properties. I just noticed now that I walked away and came back that this system is missing any information under 'guest last connected' if that's what your using to do the calc? idle time 158 days? you got something wrong with this agent or your DB. Is it possible to add a hostname lookup function to the API that returns the GUID to be used in the rest of the scripts? I added two new functions in version 1.0.12. This should be approved this week. Thanks for the idea! Thanks a million, cant wait for this going to save me a LOT of hassles. Outside of working from Automate, everything can do with working from session and host names, so if you ever feel like extending that it is definitely useful from a pure ScreenConnect side of things. Has anyone tried this in combination with the Labtech Powershell Module ( http://labtechconsulting.com/labtech-agent-powershell-module/ ) ? I can't seem to get the SCCommand to work. Keeps saying "'iex' is not recognized as an internal or external command". Please post full command omit your key though. the problem is definitely the quotes, but I can't seem to get them right. but when I put it in @SCCommand@ to run with the "Exe Batch command", all quotes disapear and I get the error " Missing ')' in method call. " I've found that Piping in powershell doesn't work in the command so did it like this. but I get the same error. Missing ')' in method call. Through some trial an error this works for me. 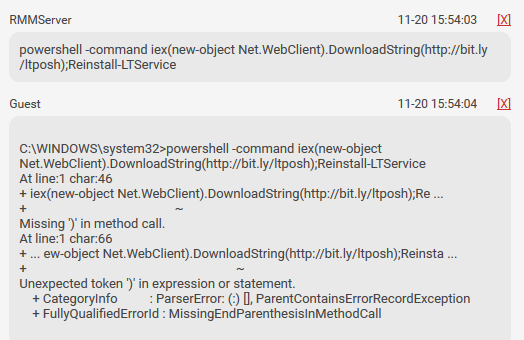 Powershel -command "& "Invoke-RestMethod -Method Post -Uri '@SCExecCommandURL@' -Body '[\"@scaccesskey@\", \"@scguid@\", \"powershell -Command iex(new-object Net.WebClient).DownloadString(''http://bit.ly/ltposh'');Reinstall-LTService\", \"10\" ]' -ContentType 'application/json'";"
YES, this works perfectly. Thanks a lot for the fast responses and thanks for the great plugin. Is the extension supposed to auto update? I'm on 1.0.7 but I see 1.0.12 is out. When I check on "check for updates" in Control, it shows as up to date. I believe for the http/post plugin, the time out is in milliseconds because that is the time frame Screenconnect uses, right? Don't know how to actually time it though. Edit: Anything higher than 10 for the timeout seems to fail the plugin. Definitely not able to do 60 and higher. Was trying to anticipate slow internet connections. Also, figured out that file paths need an extra \. For example, C:\windows\temp\file.exe would be c:\\windows\\temp\\file.exe in order for it to work correctly. Hope this helps out in the future. Hi there - We are trying to load the plugin file into LT via plugin manager but are receiving an error message and not sure what to do. I've attached that error message to this post. We are wondering if the issue is because we are cloud based? Not seen this one and I know many people use the plugin on cloud. Maybe right click the DLL and go to properties and unblock it first? Also install plugin as a superadmin.